Who came? Eric_Yarnell,_ND? (part 1 of gracious hosts) and Dave_Howell? (part 2 of gracious hosts) were of course in attendance. In the first 45 minutes, we saw arrive Ava_Jarvis?, ChadUrsoMcDaniel, Ben_Sklar?, Alex_Swavely?, Nat_Dupree?, Steve_Dupree?, Tim_Higgins?, AlphaTim, and Alex_Duncan?, attending his second ever Seattle Cosmic. At around 18:35, Ron_Hale-Evans?, Marty_Hale-Evans?, and Melinda_Hautala? arrived. 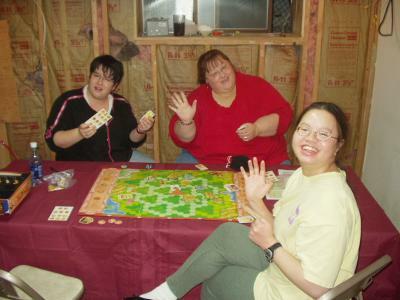 The latter two are part of the Triple Threat Sisters of Gaming Doom (can't you just picture their parents yelling, 'Marty, I mean Meredith, I mean Melinda, whatever your name is, get over here! '), who will be mentioned again soon. Melinda visits occasionally from Kentucky (like another Seattle Cosmic commuter from Lexington, Meryl_Douglas?, who was in Costa Rica and not Seattle). Anyway, at 19:30 Jay_Lorch? and Michelle_Teague? arrived, followed by Mark_Haggerty? at 21:10 and finally the last Triple Threat Sister, Meredith_Hale? with Kisa_Griffin?. 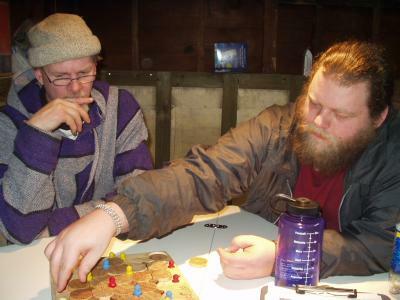 The last two illustrious persons were present only to pick up Melinda and indulged in a little Zendo as noted below. 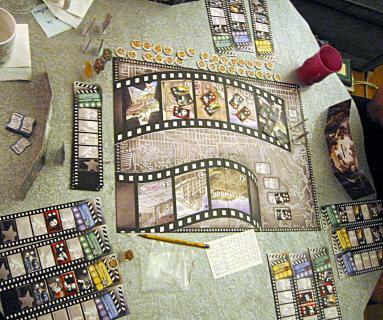 If you are wondering about the mysterious title for this game night, read on. 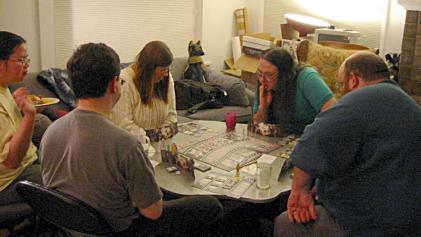 This was the second game night at our new house in the Maple Leaf district of Seattle. 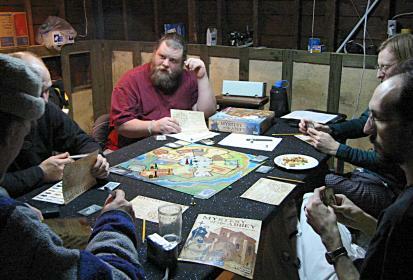 We have a new theme when game night is hosted here at the northern edge of the University District--we will have the principle game playing area somewhere completely different! The first time around, it was up in the attic, which will someday be the actual game room. This time around, we decided to show off our messy but improving basement. The most stellar object of the night had to be the table Dave recently made out of a door. He upholstered it with batting (he search high and low across Denver and Seattle for the perfect stuff) and a cool black and shiny blue felt. We're very proud. 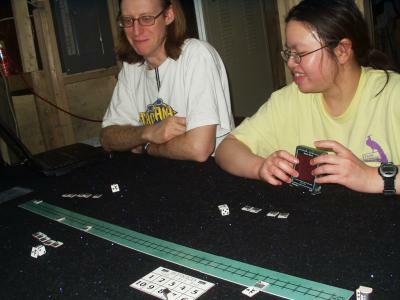 It is a perfect surface for playing Diceland, though it still does not have rails at the edge that would prevent the dice from flying off the table. But we don't want a pool table so this will have to do. Not being very experienced at game hosting I am still constantly amazed by how hard it is to keep tabs on who is coming and going. There seem to be so many people running around. Thus, we decided to post some signs so that people would get the most important elements of the house, which is under construction and thus slightly dangerous. The signs were, in order as you came through the front door, "COATS." Most people didn't seem to see this one as it was on the left hand side of the hallway. Instead, straight ahead was the first most visible sign pointing into the kitchen, "FOOD." Everyone saw this (evidenced by everyone eating and drinking). Through the old kitchen was the sign pointing down to the basement reading, "GAMES." So far, so good. Everything is building up to the great finale. However, as one descended the stairs to the basement, there one saw the sign, "FIRE ESCAPE." It seemed like a good idea at the time to point this out (because we didn't actually have a door in place at the time to get out, so one would have to go out the garage door, which was not obvious). 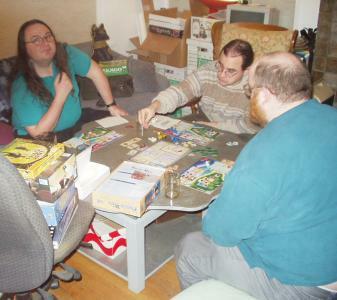 Nevertheless, I took a lot of heat for how silly it sounded after "COATS, FOOD and GAMES." Fine, the next time there's a fire at our house, you'll be happy I posted that (we have a very obvious door now so no need to fear anyway). For those who arrived early, there was a demonstration of our gadget-laden kitchen, including the fabulous New Zealand magnetic induction cooktop from Brandt. Nat also gave a demo of this great way to cook at around 19:10. Anyone is welcome to come play with our cooktop whenever they way (well, maybe not at 03:00 or anything). Players: Alex_Duncan?, ChadUrsoMcDaniel, Ava_Jarvis?, Ben_Sklar? Keeping score does not have the Buddha nature. Master Ava's koan was apparently unbreakable and has been forwarded to the NSA for cryptographic analysis. 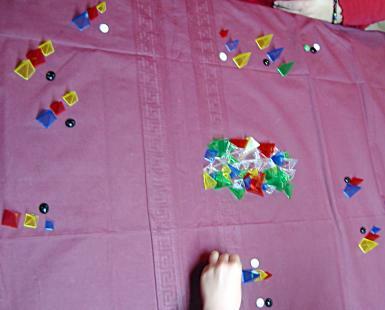 It seems to have consisted of "have at least two different size groups with two different pieces." AlphaTim described it well--an easy to learn game by Reiner Knizia that is interesting to play and quick, yet sufficiently deep to be worth playing. I look forward to this in the future. 'Tis always a rare event to play a game with Tim Higgins and not have him win by a big margin. Argh, I just lost a whole bunch of edits. Wiki'ing is fun but occasionally highly annoying. Oh well, read on dear reader. Prize: Ron took a mini Furby toy or a Brawl? deck, not even he appears to know. Alex S did not appear to take a prize. 1. 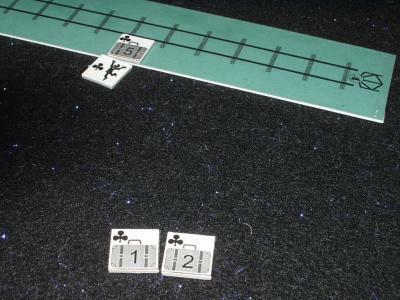 Ron abandons train in Game 1. 2. Luggage scattered all along the track by the chicken passengers. 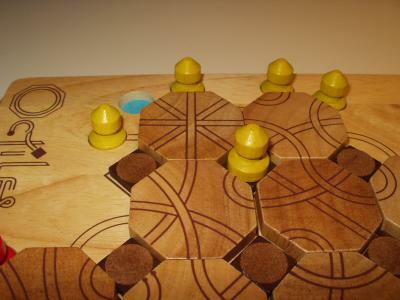 This is a prototype game by Tim Schutz designed for a competition in Italy. It is a quick, light game of trying to get your valuable luggage thrown off a train speeding to its demise while everyone else does the same. As Tim described it, it is souped up chicken, because you have to decide how long you're willing to risk being greedy trying to get your luggage off (interfered with by all the other players trying to do the same thing) and risk falling off the precipice into the bay and dying. After this game ended I tried desperately to get my prototype True Believers game ready for play, but I just couldn't pull it off despite heroic attempts. Too many cards and changes since the last play test! Many little multicolored huts were moved about in time to the gentle clicking and blowing of the hydronic heat boiler. Details anyone? No, we are not playing in a mountain cabin by lanternlight. This is Dave and Eric's basement, and that's a Nalgene bottle. So close! Ron misses the win by one tile. 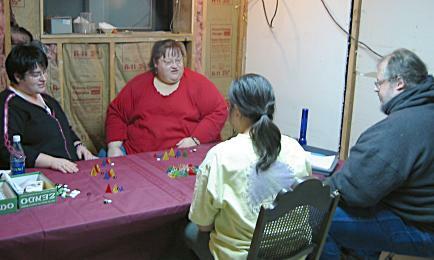 What would Seattle Puerto Rico Game Night be without a game of Puerto Rico? Keeping up the tradition, eh gents? 2. 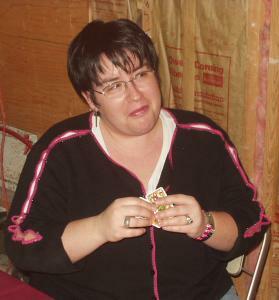 Melinda shows what her sister Marty looks like while thinking. Another exciting round of building weird long cities with pretty colors. Tim Higgins left at 22:24. Looks like some pretty good competition there. What happened in this whirlwind of filming and fancy directors' parties? If a score is recorded in the woods and no one reads it, does it make a clapping sound? It appears that Chad was Master first with the koan "two yellow pyramids." Simple yet elegant. Mel figured it out at 22:34. Master Mel then had the more tangled koan "a small one of any color, a blue one of any size, and a third pyramid of any description." 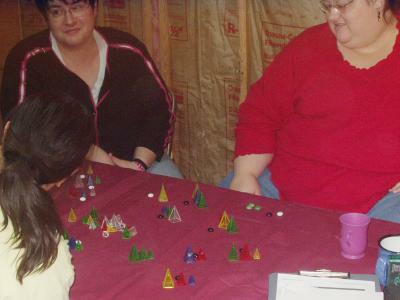 It appears that Mel was a little unclear on some of the details of the game, and when no one figured out the koan, Mel finally spilled the beans. Meredith and Kisa stepped in to play sometime after Chad left. I don't know if this Wiki can hold everything I have to say about this game. Dave and I purchased this at Gen Con West, having never played, which breaks one of Dave's cardinal rules of games. But we had heard some good things, and decided to risk it (it was expensive too!). 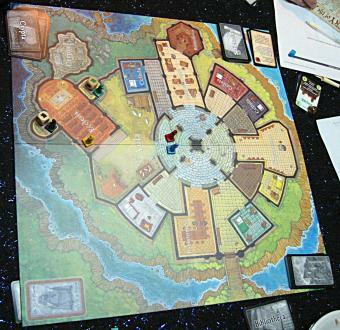 Anyhow, this game has been described as Clue on steroids. It is kind of surprising how few Clue-like games there are given the overall popularity of Clue itself (which is an ok but fairly undeveloped game IMHO). The major flaw in this game as I see it became apparent immediately--the information gained by asking questions is EXCEEDINGLY difficult to document, let alone utilize. It quickly became very frustrating to look at all the scribbles on my info sheet and interpret what the heck they meant. 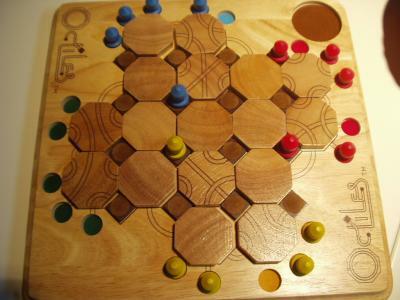 Other than this, it seems like an ok game. I am not sure I would have spent as much as we did if I had played it first. Definitely better than Clue and certainly requires some real logical thinking. Despite all this complaining, I won! Yahoo. I am so excited to use my space alien to play the various Cheapass Games with zombie themes. Next meeting is 17 January 2004 at Tim Higgins' house in Mill Creek. Come play for fun and FABULOUS PRIZES from the PrizeBag!